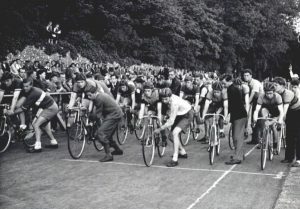 Opened on 12 May 1877, Preston Park cycle track is both the oldest velodrome in the UK and the oldest, working velodrome in the world! According to Wikipedia, all older velodromes have either fallen out of use or been redeveloped, leaving Preston Park as the oldest velodrome still in regular use on the entire planet! The velodrome was originally built by the British Army, the arena being dug out entirely by hand! At that time the arena comprised a cricket pitch, surrounding cycle track, pavilion and open air, flint-edged seating for thousands of people. Remarkably it remains in use for both cricket and cycling to this day, the original pavilion is still standing and the flint edged seating can still be seen around the North and Eastern sides of the track. 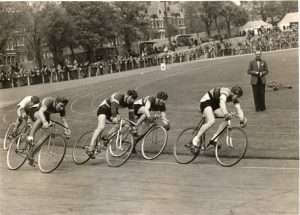 As well as being the oldest track in the country, Preston Park can boast of being the longest at 579m (1900 feet) as well as being one of the few velodromes which is not the normal oval shape, instead comprising the rather unusual shape of four straights and two slightly banked corners. 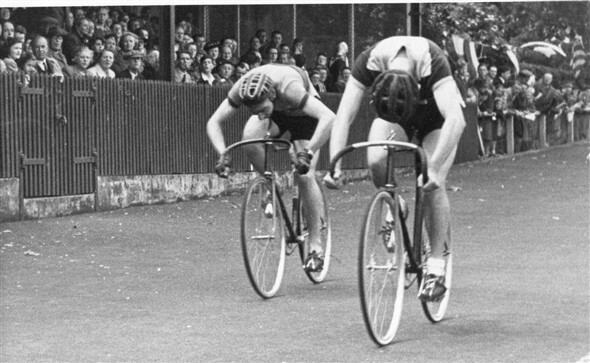 Occasionally visiting riders to Preston Park velodrome comment on this, but it is because there were no international velodrome standards until after Olympic track cycling grew in popularity after 1900, so early velodromes from the late 1800’s came in all shapes and sizes. The original surface was made of cinders, so riders who crashed had to be taken to the clubhouse to have the cinders removed from their wounds with hot water and a scrubbing brush! In 1930 a grandstand with wooden seating for 500 people was added, followed by a tarmac surface in 1936, with the two banked corners added at the same time for safety reasons. 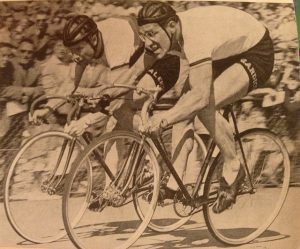 Attendees of 3000-5000 spectators were a regular occurrence with the largest recorded attendance reaching 8,000 in August 1952 to see world champion Reg Harris in action. Other sources put bank holiday race attendances at 10,000 spectators! Arie Van Vliet and Reg Harris sprinting at Preston Park track. Apart from two world wars, the only other known period when racing stopped was in 2015 when the track fell into general disrepair due to a lack of public funds for ongoing maintenance. Following rider concerns about safety issues it was deemed unsafe for racing by British Cycling in 2015 with the quality of track fencing being the main issue. While this didn’t prevent recreational use of the track or PPYCC Saturday morning sessions, it did mean that official racing had to stop, such as the SCRL track league and PPYCC racing events. A successful Save Preston Park Cycle Track campaign included a mass protest ride through the streets of Brighton ending at the velodrome, attended by many PPYCC riders and parents along with hundreds of supporters from the wider cycling community, demonstrating the value of this important amenity not just to cycling clubs and racing leagues but to local families and recreational cyclists who all use the velodrome regularly. The council eventually put money forward along with funding from British Cycling, and the fencing was brought up to date with £150,000 of repairs and racing was able to resume in 2016.